High Five Events announces Z’Tejas will cater the Hilton VIP Experience at the 2019 Ascension Seton Austin Marathon presented by Under Armour®. Z’Tejas will provide Southwestern cuisine and refreshments at the finish line VIP. The Hilton VIP Experience, which includes VIP access at the start and finish lines, can be purchased for the current price of $99. The Austin Marathon will take place on Sunday, Feb. 17, 2019. 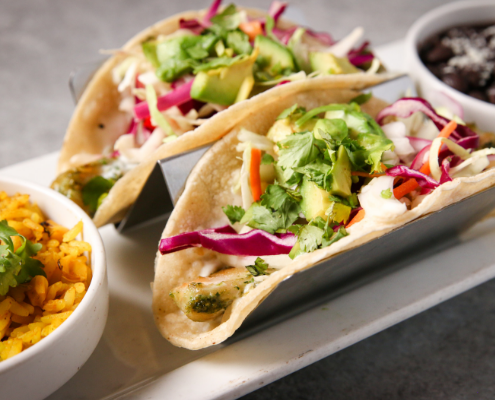 Z’Tejas, founded in Austin in 1989, serves Southwestern cuisine with bold, flavorful twists. Their chefs work hard to create authentic, memorable dishes with only the best, fresh ingredients. Mexican classics like Chili Pork Verde, tender Carne Asada, and Grilled Shrimp Tostada Bites can be found on the menu. Customers can also enjoy Asian and Caribbean-fusion dishes like Cast Iron Skillet Dumplings and Jerk Chicken Salad. Freshness, quality and a commitment to hand-crafted cuisine are present in every delicious bite. The Hilton VIP Experience at the finish line features views of the marathon and half marathon finish lines, Z’Tejas catered lunch, adult beverages, and live music. The pre-race VIP is next to the start line. It offers private restrooms, pre-race breakfast and drinks, and a separate gear bag check. Everyone who purchases the Hilton VIP Experience will also receive 20% off exclusive Austin Marathon gear at the expo. High Five Events is excited to announce the fourth round of accepted athletes for the 2019 Ascension Seton Austin Marathon presented by Under Armour®. Returning for its third year in a row, this opportunity creates a competitive field of elite male and female runners while discovering emerging talent, pushing the entire talent pool to reach Olympic standards. FloTrack’s live coverage highlights the competition amongst the elites, following male and female marathoners and half marathoners. The prize purse breakdown follows: $15,000 for the marathon, $5,000 for the half marathon, and $6,000 for the Manzano Mile presented by Dole. Runners not accepted into the Elite Athlete Program are still invited to run in the Elite Field. Read about the first, second, and third round of accepted elite runners. The fifth round of athletes will be announced soon. Applications are still being accepted and elite marathoners can apply on the Austin Marathon’s website. Athletes that meet the program’s standards and are accepted will be given one comp entry to the 2019 Austin Marathon or half marathon, reimbursement eligibility, and standards bonuses. High Five Events is excited to announce the third round of accepted athletes for the 2019 Ascension Seton Austin Marathon presented by Under Armour®. Returning for its third year in a row, this opportunity creates a competitive field of elite male and female runners while discovering emerging talent, pushing the entire talent pool to reach Olympic standards. FloTrack’s live coverage highlights the competition amongst the elites, following male and female marathoners and half marathoners. The prize purse breakdown follows: $15,000 for the marathon, $5,000 for the half marathon, and $6,000 for the Manzano Mile presented by Dole. Runners not accepted into the Elite Athlete Program are still invited to run in the Elite Field. Read about the first and second round of accepted elite runners. The fourth round of athletes will be announced soon. Applications are still being accepted and elite marathoners can apply on the Austin Marathon’s website. Athletes that meet the program’s standards and are accepted will be given one comp entry to the 2019 Austin Marathon or half marathon, reimbursement eligibility, and standards bonuses.